Want to add a little sway to your summer? Look no further than the all-level hula class brought to you by Ruby Mimosa (aka “The Island Flower”) over at the Academy of Burlesque. The four week class runs July 3 through 24 for just an hour and a half each Wednesday, and drop-ins are welcome. Ruby Mimosa was born in Kaneohe, O’ahu and is the fifth generation of her family to be born and raised in Hawai’i. From the age of three Ruby studied dance, including hula and 13 years of ballet. Aside from these lifelong passions, Ruby also studied fashion merchandising at the University of Hawai’i. As it happens, seven years ago this week Ruby transferred from Betsey Johnson O’ahu to the boutique’s Seattle location- bringing with her just a few suitcases and plenty of Aloha Spirit (“the coordination of mind and heart within each person”, according to the Hawai’i Revised Statues). Ruby’s great great grandfather, Fritz Herman, started The Kodak Picture Hula Show in 1937 at the Waikiki Shell. The performance venue linked Hawaiian-style entertainment with photography by providing a hula show during the day, where traditionally the dance was only seen by tourists venturing out to evening luaus at resorts. Initially the Kodak Hula Show featured five dancers and four musicians, but the attraction quickly grew in popularity and expanded to a cast of 20 women, six men, and over a dozen musicians. 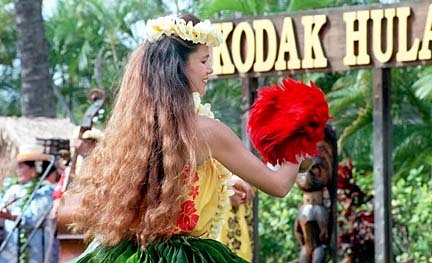 The Kodak Hula Show ran for over 60 years. Want a little tropical stay-cation? Look no further than here, Hula Hands & Hips! Miss Ruby Mimosa will help you achieve that soft dewy glow of the Pacific Islands right here in Seattle. Trained in the art of Hula, Ruby teaches the fundamentals and basic movements of this stunning storytelling dance form. Enjoy the classic and tropical tunes of Hawai’i while engaging your core strength and graceful beauty. Movement friendly clothes are preferred, and grass skirts are optional! Class open to all levels, oriented towards beginning dancers who want a fun workout! $65 for the series, $17 drop-in. For more info, visit the event page: https://www.facebook.com/events/131397980385845/, or check out the Academy’s curriculum page. Our second pick of the week (where incidentally, you’ll also find Ruby representing The Burlesque Boutique at the merch counter) is way more fun and only a little bit safer than fireworks: Freedom Fantasia. Now in its third season, DeLouRue Presents is mounting this year’s show for three nights/four shows at the Triple Door. 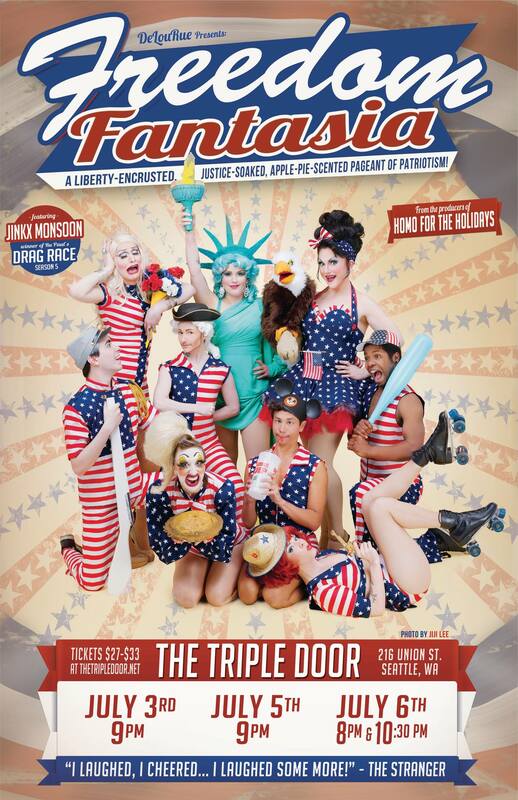 Freedom Fantasia reclaims patriotism by taking a closer look at American history with honesty and high camp – exactly what we love from the production trio of BenDeLaCreme, Lou Henry Hoover, and Kitten LaRue. There will be buffalo, pasties, and drag – and what would the 4th of July be without a little tap dancing and historical rap? DeLouRue Presents, a production company from Kitten LaRue (The Atomic Bombshells), BenDeLaCreme (TUCK! ), and Lou Henry Hoover (The Cherdonna and Lou Show) invite you to experience their third annual Fourth Of July spectacular…featuring a venerable cast of Seattle luminaries, including WINNER of RuPaul’s Drag Race Season 5: internationally-beloved drag and theatrical sensation, JINKX MONSOON! ~ by angrytruffle on 07/01/2013.